Police officers surround the scene of a motorcycle accident in the first blocks of Valencia Street, on December 3, 2018. 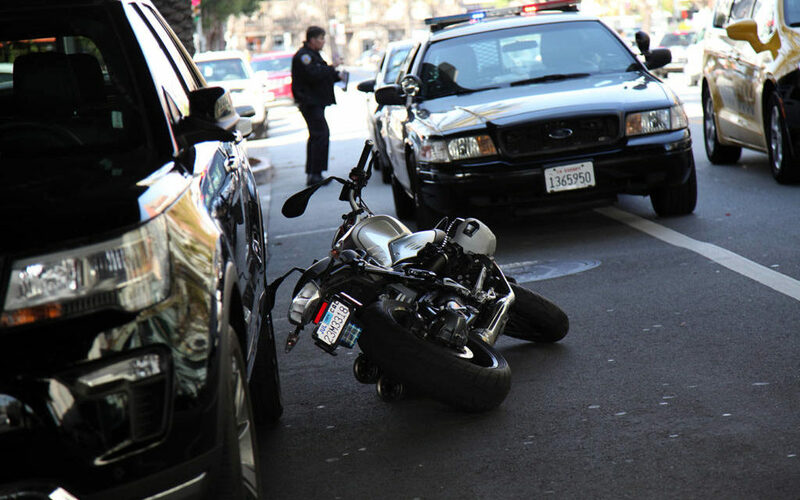 A collision between an SUV and a motorcycle on Valencia Street between Duboce Avenue and McCoppin Street on Monday around noon left the rider injured and backed up traffic. The black Subaru Outback hit the gray BMW cycle from the left, right under the freeway, and sent it skidding toward the other side of the two-way street. The victim, a man whose information was not provided, was hurt and carted off in an ambulance — but remained conscious throughout, according to police on scene. The block of Valencia between Duboce and McCoppin remained closed from the time of the accident until 1:15 p.m. while officers examined the trail of debris left by both vehicles and questioned a few onlookers who happened to be close to the scene. According to the police, the woman who was driving the SUV indicated that she was pulling to the left before the turn when she struck the motorcyclist. Contrary to that scenario, however, a security guard for the parking lot below the freeway indicated that the woman was attempting a U-turn, and hit the bike while making that sweeping motion. The impact dented the SUV’s driver’s door and broke the left mirror. As a motorcycle rider I cannot state strongly enough how much I am looking forward to self driving cars.